Our security research specialists label Spunchtv as an adware application. It means that when this program enters your computer, it begins tracking your web browsing habits, and then it displays customized advertisements on affiliated websites. Although we cannot claim that Spunchtv is a malicious infection, there are still certain computer security issues associated with this application, and so we strongly recommend that you remove Spunchtv from the system, along with any other potentially unwanted application that might have come with it. Adware programs often get distributed in groups, so you should scan your computer. Judging from the official website for this application via spunch.tv, this application is supposed to be “an open and advanced platform for broadcasting live events.” In other words, the application should help you create your own online channel for live internet broadcast. In fact, there is no direct download link available at the official website. Spunchtv only offers you to subscribe to its service. It says that you can join a partner program to “monetize your streams and enjoy revenue share.” However, quite a few users complain about being assaulted by Spunchtv ads constantly even though they do not subscribe to the service. It shows that Spunchtv gets distributed bundled with freeware. Also, research shows that users often install Spunchtv on their computers accidentally when they click on third-party ads. You might not even notice how this application enters your computer. If you are experiencing an onslaught of commercial advertisements and you have no idea where they come from, check the list of installed programs on Control Panel. Spunchtv should have an entry there. Also, you can check whether BackgroundHost64.exe process is currently running via Windows Task Manger. The process belongs to Spunchtv, and if it is there, then you clearly have the adware application on board. Despite that Spunchtv may actually help you stream your video online, you should seriously think twice before allowing this application to remain on your system. Since the program displays a lot of commercial ads, eventually, you might get exposed to corrupted websites that distribute malware. We are not trying to say that Spunchtv is a dangerous infection, but such adware applications are often exploited by cybercriminals in malware distribution schemes. Hence, if you are a computer security-minded user, you will uninstall Spunchtv today. If you are not sure how this application entered the PC, after manual removal you should also scan the PC with SpyHunter free scanner. You need take all the potential risks into account and make sure that your computer is clean and safe. For any further questions, do not hesitate to leave us a comment below. 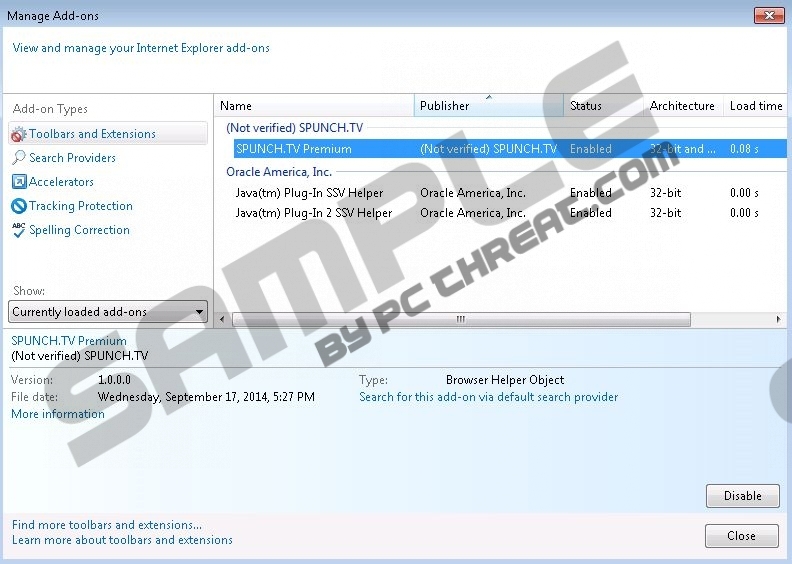 Select Uninstall a program and remove Spunchtv. Go to Uninstall a program and remove Spunchtv. Go to Add or remove programs and uninstall Spunchtv. Quick & tested solution for Spunchtv removal.